Refractometers are widely used in the wine and beer industry by to track fermentation, but less commonly used by home brewers. However, if used properly a refractometer can be a great tool to track specific gravity in place of or to supplement your hydrometer. This week, I take a look at refractometers, how they work and how an average home brewer can use one. I’m going to use BeerSmith as the refractometer conversion tool, as the hand calculations are fairly complex and could occupy another entire article. A refractometer is an optical device that, like a hydrometer, measures the specific gravity of your beer or wort. It does so by sampling a small amount of liquid, and looking at its optically. The main advantage over a hydrometer is the small sample size needed – typically only a few drops. Before you use a refractometer, it needs to be calibrated. Most refractometers are calibrated by using a sample of distilled water. You lift up the daylight (sample plate), and add a few drops of distilled water. Close the daylight plate and allow the water to spread across the sample plate. Make sure there are no bubbles. Refractometers are temperature sensitive, so allow the sample to reach room temperature unless you have a model that automatically compensates for temperature. Hold the refractometer up to natural light and take a reading. Most refractometers have a calibration knob or screw that will let you adjust the zero setting. What you want to do now is adjust the refractometer so it reads zero with distilled water in it. This may take a few tries. If you can’t zero it out or it is not adjustable, you can handle the adjustment using BeerSmith (see the calibration items under the refractometer tool). If you want an accurate reading, you should also calibrate the refractometer using a wort sample that has a known specific gravity. You can do this calibration by mixing up a small amount of dry malt extract with water, then take an accurate hydrometer reading and also refractometer reading and enter both readings into the BeerSmith refractometer tool (use the “calibrate refractometer settings” button). Using the refractometer is very similar to what you just did when calibrating it. Open the sample plate, make sure it is clean and dry, then add a few drops of your wort. Again, if the wort is hot allow it to cool to room temperature first (ideally 68F). Close the sample plate, check for bubbles, and then hold the refractometer up to a natural light source. Reading the refractometer is easy – just take the reading directly from the sight scale. The reading you take will most likely be in percent/degrees Brix or RI. Here’s where some people get disappointed when using a refractometer. Refractometers are calibrated to measure the amount of sugar (sucrose) in a clear sample of water. The sugar in barley beer (maltose) is a different animal. Therefore some adjustment needs to be made to take into account the fact that we’re measuring colored maltose and not clear sucrose. You can’t just use the measurement you made with the refractometer. Converting the Brix measurement to a specific gravity or Plato measurement made on a sample of unfermented wort is a moderately complex calculation which requires a spreadsheet or a tool like BeerSmith. However, there is yet another complication: once the wort starts fermenting alcohol is produced, and the alcohol changes the overall equation yet again. In practice, this means that in order to calculate the true gravity of a fermenting or fully fermented beer, you need not only the current refractometer reading, but also the starting gravity. So if you are using a refractometer, it is critically important you record the starting gravity of the wort before fermentation if you want to calculate a mid-fermentation or final gravity for your beer. Now that we’ve calibrated your refractometer, and understand the limitation, open up the Refractometer tool in BeerSmith. Assuming this is your original gravity reading for unfermented wort, select the “Unfermented Wort Gravity” calculation at the top and enter your Brix (or RI) reading from the refractometer. The “corrected gravity” will show your original gravity for the beer. Once you have your original gravity and the wort is fermenting, you can take additional readings. In this case use the “Fermenting Wort Gravity” calculation in the tool and enter both your Brix refractometer reading and the original gravity. The corrected gravity will show your current adjusted reading. There is a third calculation in BeerSmith, called “Finished Beer ABV/OG” which lets you back out the original gravity of the beer if you forgot to measure it in the first place. In this case you need to take a final gravity measurement with both the refractometer and an accurate hydrometer, and enter those readings to get the original gravity. Thank you for joining me on the BeerSmith blog. Check out my weekly newsletter and new book if you want to read some of the dozens of articles I’ve written on home brewing. After a frustrating brew day, I am almost 100% ready to make the plunge to buy a refractometer. It just seems sublime – no mess, no lost beer, no broken hydrometers, no hassles. Just plug the measurement into my BeerSmith 2.0 software, and Voila! Thanks for the great article – it shows me how easy it will be with a simple tool, and your software! Thanks for the info here… seems very simple and straight ahead when the refractometer and BeerSmith are used together. Can’t wait to try it out. How often do you need to calibrate using the wort, refractometer and hydrometer? Like Frank asked, calibrating on zero with water is less effective than calibrating with a known gravity? If so, by how much? Would my actual gravity be off by a point or so, or by ten points if calibrating by water (I cant see myself making a small solution every time I want to calibrate). I use a ATAGO hand held digital Brix meter. To check my instrument I’ve made a 10.0 % w/w solution of table sugar and water using a digital balance (ideally a calibrated one of course). I then take the reading and compare. There are available for purchase calibrated solutions from various vendors. Though they are pricy but are also certified materials. I don’t see mentioned here the utility of using the refractometer during the brewing process BEFORE the original gravity measurement. It is useful to evaluate the gravity during the boil to determine if more evaporation loss time is needed or to add top up water before the boil ends (helping to reduce contamination). I rarely have had to adjust my boil like this because of careful calculations and BeerSmith help. The other helpful time to use the refractometer is during the Mash. Taking samples along the way allows me to see how the saccrification step is progressing. I usually hit 19-22 Brix and then wait for at least a 15 min plateau in the readings before mashout. I have never been able to make the iodine starch test work for me. During the sparge the boiler collects increasingly dilute wort which then concentrates during the boil. Testing only a few drops makes it possible to take as many measurements as you want. Prost! This is a informative post about refractometer. I learn here how to use it and find out the exact reading. It measures the specific gravity. I’m a brazilian homebrewrer and and just really loke your products: BeerSmith 2 and Beersmith 2 for smartphone. 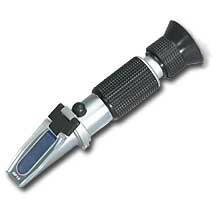 1.- In Tools/refractometer that should also be possible do input de refractometer reading in Gravity, not only in BRIX. This is also for beer smith for PCs. I have that on my “to do” list. It is not hard to convert though since Brix and plato are the same scale. To go from SG to Brix/plato you just cut off the 1.000 and divide by four. For example 1.048 is approximately 48 points which you divide by four to get 12 plato or 12 brix. Well 1.030 is a specific gravity reading – generally done with a hydrometer that is an indication of the density and sugar content of the sample. It corresponds to about 7.56 Brix or rougly 7.5% sugar content. I don’t know what the 25% means unless they meant 25 Brix which would be a much higher sugar content than the 1.030. I double that pineapple/water melon have that high of a sugar content in a simple wort unless you have concentrated it. Is it possible that “Fermenting Wort” tool does not take into account the calibration settings? I’m using the Android version of beersmith 2 (version 2.3.4), and given a pair of og and brix reqdingss I get the same results for whichever calibration settings i use. Hey there, I’m sorry if I’m intruding but I was wondering if you had any experience with https://www.berthold.com/en/pc/news/brix-concentration-measurement-vacuum-pans and what do you think of them? My recollection is that Brix measurement is based on the optical rotation caused by sugars / starches in solution.. not on specific gravity. Hence you use a hydrometer to measure alcohol but to the best of my knowledge Brix simply tells you how much sugar is present. Hence in my experience in the distilling industry the two are used complimentary, Brix to understand sugar content and drop as fermentation proceeds. Spec Grav to tell the amount of alcohol in the beer or wine. Refractometer : Rather than measuring the density of a liquid directly, they calculate sugar content based on the refraction of light through your beer. While pricier, you can use much smaller sample sizes without temperature becoming such a niggle. If you re an intermediate or more advanced brewer, it s well worth making the modest investment in one of these.